The use of third-party countermeasures is an increasingly common phenomenon in international relations, yet their legal position remains uncertain. 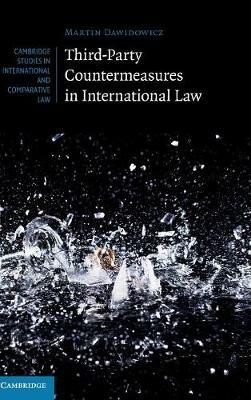 Providing the first systematic and comprehensive study of this key concept in international law, Martin Dawidowicz explores the position of third-party countermeasures and their safeguards regime based on the development of ideas on countermeasures in the UN International Law Commission and a thorough examination of state practice. The book clarifies the position of third-party countermeasures in international law, and in doing so challenges some widely held assumptions about the likely impact of a regime of third-party countermeasures on international relations. It will be of interest to international law and relations scholars and students, diplomats, policy makers, international civil servants and non-governmental organisations (NGOs) in the field of human rights.